Nearly every breed of dog will have a skin allergy in their life time, but those allergies can easily be controlled or even prevented. Cyclosporine (Modified) helps to treat the skin disease atopic dermatitis found in dogs, which can cause skin allergies and hair loss, as well as heavy scratching and licking. The medicine is FDA-approved and is a safe treatment for skin allergies even in dogs as young as six months old. It is also sometimes prescribed by veterinarians for treatments in cats. 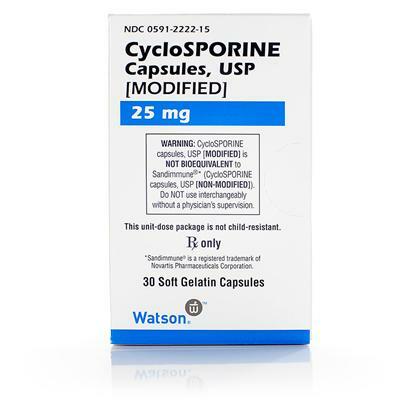 Cyclosporine (Modified) is an immunomodulator that works on the cells that causes allergic reactions in dogs. This oral capsule can easily be dispensed in wet food or hidden in a dog treat. Instead of taking your dog to get a steroid shot, Cyclosporine (Modified) is a less intrusive and less expensive option, and is just as effective. Please consult your veterinarian for side effects or any drug interactions. Give 2.5mg per pound of body weight. The medication is usually given once a day to start until satisfactory improvement is seen, usually 4-8 weeks. The medication can then be given every other day until the clinical signs of atopic dermatitis are satisfactorily controlled, then the medication can be given every 3 or 4 days. Always give 1 hour before or 2 hours after a meal. Allow plenty of water for the pet to drink.